Looking for indoor blinds that can complement your home’s interiors. Uncover Complete Home Improvement’s vast range of indoor blinds and acquire some excellent ideas. Complete Home Improvement’s products are known for quality workmanship, value and innovation. Our array of window coverings include Roller Indoor Blinds, Roman Indoor Blinds, Venetian Indoor Blinds, Vertical Drapes Indoor Blinds and Panel Glide Indoor Blinds – all with a focus on durability and exquisiteness. Choose your preferred indoor blinds today and see how your interior enlivens! Indoor Roman Blinds adds an architect’s touch to any room. It’s a distinctive indoor blind that features a variety of pleating options from chrome to wooden, the plain pleats (rear extrusions) creates a flawless tailored appearance. 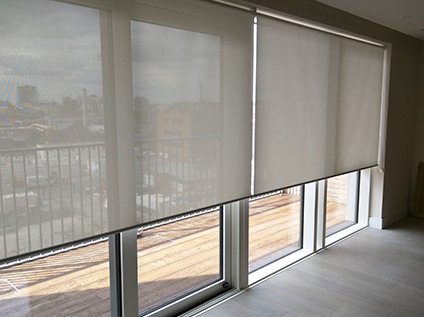 Indoor Roller Blinds are handy and simple streamlined blind that provides you with complete flexibility from light filtering to full block out. Furthermore, indoor roller blinds can be fully customised to suit each individual’s unique needs. Indoor Venetian Blinds render a tender feeling to any room with their refined usefulness and traditional timber look. Available in an array of timber finishes including white, and available in aluminium, a Venetian blind can be utilised in any kind of room. Indoor Vertical Drapes Blinds can be stacked towards the right or the left, can open at the centre facilitating utmost light, and completely block out when closed. They are also available with coordinating Pelmets/Valance. Indoor vertical drapes blinds are one of the most affordable blinds on the market today with special features such as width sizes as wide as six meters. Indoor Panel Glide Blinds are a modern and trendy product on the market having smooth glide track system and a wide-ranging fabric selection. Indoor panel glide blinds are mainly suited to oversized windows and big glass sliding doors. In addition, indoor panel glide blinds can be used as room dividers with a diverse range of stacking choices towards the left or the right and opens up from the centre as well. If you want to install beautiful indoor blinds and augment your home’s interiors, then give us a call at Complete Home Improvement on 1300 912 293.